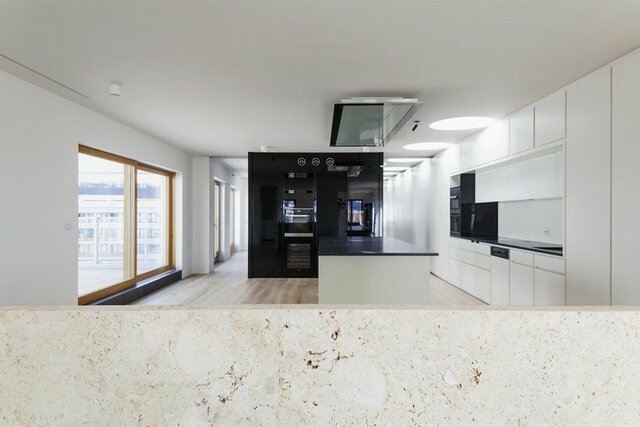 The grandiose two-storey apartment in a modern newly built house on Rohanský Island offers exquisite views together with precise design by the renowned EM2N Swiss group of architects. The apartment occupies the two top floors of the western wing of the Vltava Residence, fully utilising the attractive panoramic views of Prague from Petřín via Prague Castle and Letná to Vítkov, underlined by the immediate proximity of the river and its green banks. Purchase price includes four garage parking spaces and four cellars of 16 sqm. The spacious upper floor is the social hub of the penthouse thanks to its access to the terraces. There is a living room with dining area and fireplace, kitchen, master bedroom, two bathrooms with toilette, dressing room and laundry. Both units have their own entrance and elevator directly to the apartment. The centrally situated staircase is the main artery of the apartment, opening access to the downstairs part of the residence with another two bedrooms, each with its own bathroom and an office with a loggia. The key interior elements feature stone, glass and other materials in timeless grave shades of black, grey and white with matt and glossy finishes. The heated floor is covered with light oak floor boards and the fireplace is lined with fine light stone. Penthouse equipment includes also its own data network, air conditioning and shading of terraces.